This article will help you attach emails sent outside of Infusionsoft to a contact record created/updated in Infusionsoft. If this is for an email you received, and not an email you sent, there is nothing special to do here. 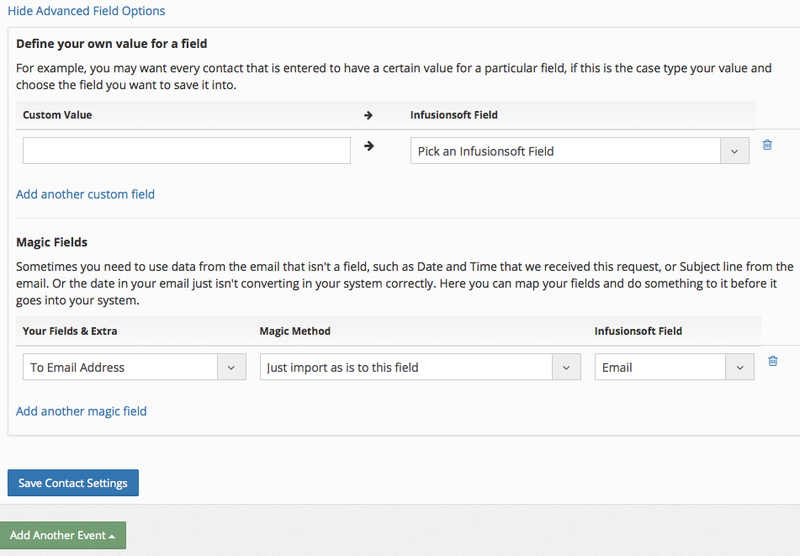 Just make sure the email address you've parsed from the notification is mapped to the Infusionsoft Email Field. If you're BCC'ing Parsey with the intent to store a copy of your communication in the recent email history of the contact record to whom you're emailing, you'll want to expand the Advanced Field Options and configure a Magic Field. From the 'Your Fields & Extra' drop-down menu, select 'To Email Address'. From the 'Magic Method' drop-down menu, select "Just import as is to this field". 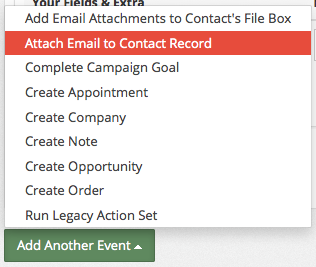 From the 'Infusionsoft Field' drop-down menu, select 'Email'. Click the 'Save Contact Settings' button. PRO TIP: Most users who configure this event, also have the 'Add Email Attachments to Contact File Box' event configured. REMEMBER: Attaching emails to contact records only works for email parsers. If you choose this for a webhook it will do nothing.